Who Cares What the Back of a TV Looks Like? Over the past few days I’ve heard top executives from two massive electronics companies brag about the design of their television. Normal! Well, it would be if they weren’t talking about the backs of their televisions. The photo below was taken at the Sony booth at CES just a short while after the Sony North America COO had gone on and on before a packed house about how clean the design of the back of the television was. When I took that photo a pair of foreign journalists were shooting a video I imagine included a discussion of the astounding innovation. So let’s have a look shall we? 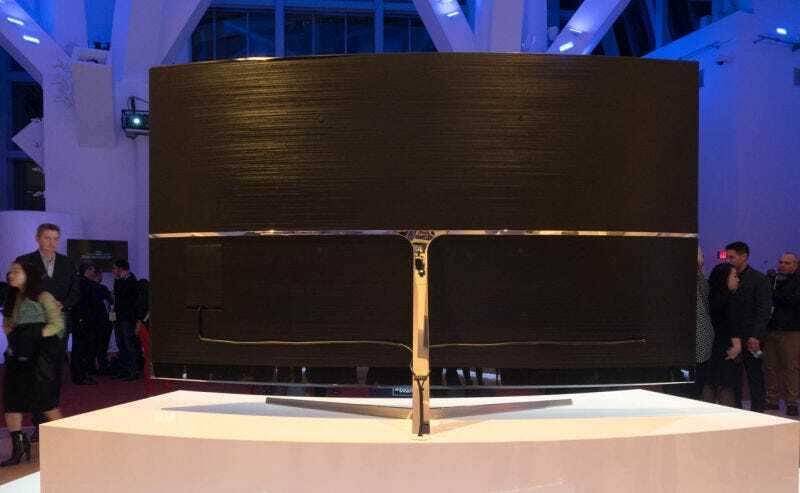 A night earlier at the Samsung television briefing, an executive boasted that, and I’m paraphrasing, the company had managed to eliminate visible screws from the back of the TV. When in the history of televisions has it mattered what the back of a TV looks like? The TV goes up against the wall! A higher truth seems obvious: The fact the back of a television is being marketed as a feature must mean that companies don’t have confidence in what’s going on in front of the TV.